Looking for information on how the Liverpool City Council kerbside clean up work? We’ve put together everything that you need to know about the Liverpool City Council kerbside clean up service so that you can dispose of your unwanted household rubbish without any worries. If you live within the Liverpool City Council district then you will be happy to know that you are entitled to 3 different types of household rubbish collections each year. Your household waste is classified as general household waste, metal white goods waste and mattress waste. To organise for a junk collection, you will need to call the Liverpool City Council on 1300 362 170 or lodge an online application to arrange for a collection date. You must ensure that only that particular type of waste is thrown out for collection when organising a free kerbside pick up with the Liverpool City Council. Ensure that the process is done properly to avoid any miscommunications and issued with an infringement for illegal dumping on the nature strip. That is why we are here to help you with the process step-by-step so that you are confident every step of the way. If you satisfy each of the listed criteria, you won’t have any problems with the Liverpool City Council kerbside collection service. You can be sure that all your junk will be taken away quietly and quickly. It should be noted that household items not accepted by the Liverpool City Council can be disposed of by other methods. The Liverpool City Council Community Recycling Centre accepts dangerous goods and electronic goods to be recycled and reused. Be sure to keep an eye out for the household chemical drop off dates to dispose of your liquids for free. Which suburbs does Liverpool City Council cover? The Liverpool City Council covers 39 suburbs and an area of approximately 305 km squared with a population of over 204,000 (2016 census). We understand that rubbish comes in all sorts of shape, sizes and materials. That is why Sydney’s industry leader, we collect nearly all types of rubbish. 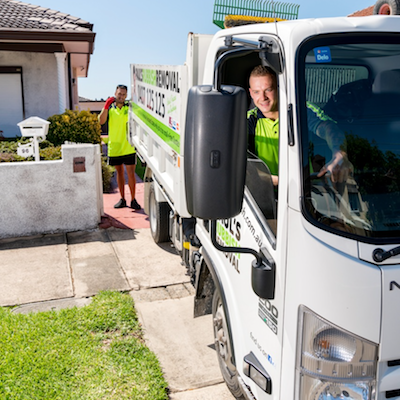 Unlike council kerbside pickups, you won’t need to carry the junk yourself. Let our experienced team do the job for you. We also collect your unwanted rubbish even if it is mixed and unorganised. The team will completely clean it up for you. Paul’s Rubbish Removal spare no expense on getting the job done in Sydney. When it comes to superior customer service, we do it best. We custom tailor our rubbish services to suit your needs and to get the job done, no matter what. It is our duty to collect your bulky household goods and dispose of it for you without all the hassle. Best of all, we offer same-day removal services to get the job done today. We’ll dispatch our nearest team to your site in the Liverpool City Council and get you sorted immediately. For a fast, cost-effective and reliable rubbish removal service, you can depend on Paul’s Rubbish Removal. Reach out to our attentive team on 0407 125 125 for an obligation free quote!